Lola Rose Jewelry was established in 2000 by London designer Nicky Gewirtz, creating 'affordable luxury' jewelry in a wide variety of stunning semi-precious stones that allow women to spoil themselves without feeling guilty. Since then the brand has grown to become one of the most successful and respected fashion jewelry labels. The highly recognisable designs now grace the wardrobes of fashion icons, like Sarah Jessica Parker, Angelina Jolie, Rachel Hunter and Halle Berry through to pop stars and TV celebrities. Debra Messing (TV's Grace in Will & Grace), wore Lola Rose to the Oscars and even Prince William can confirm, Lola Rose makes a perfect romantic gift, having given a Lola Rose heart pendant to his belle, Kate Middleton. Today through the Handbag.com Christmas gift competition, you too have have the chance to spoil yourself with a piece of 'affordable luxury'. 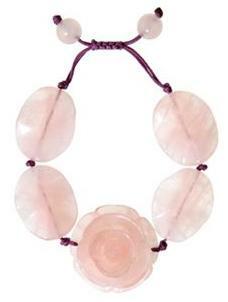 Click HERE for your chance to win this gorgeous Lola Rose bracelet valued at £60; simply adorable!